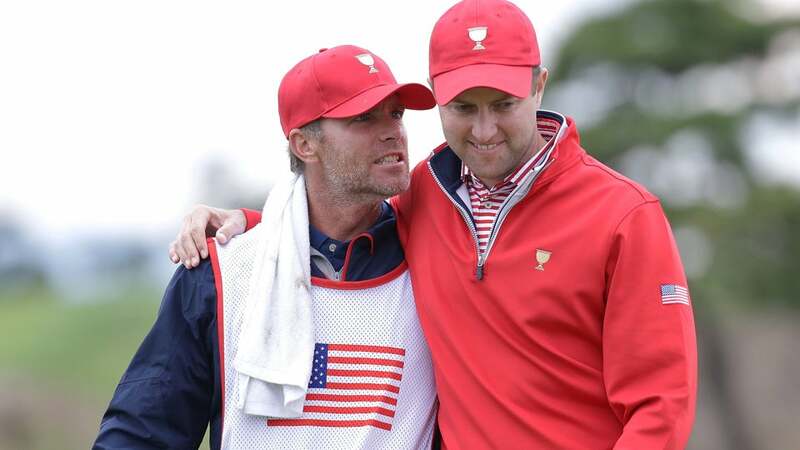 Chris Kirk of the United States celebrates with caddie G.W. Cable after a putt on the 18th hole during the Sunday singles matches at the Presidents Cup. Chris Kirk, not one to usually show much emotion, is proof that team events can bring it out of anyone, even the most stoic. Kirk and Anirban Lahiri were all square in their Sunday singles match of the Presidents Cup and both faced birdie putts on the 18th green. Lahiri was just four feet away, so at the time his putt seemed like a near gimmie. Kirk, however, had 15 feet for birdie and needed to drain it to at least halve the hole. He did – with a wild fist pump following it – and perhaps that added pressure got to Lahiri, who lipped out his birdie try and lost the match. It was a critical turn of events. Lahiri went from the heavy favorite to win the match -- before they hit their putts on 18 -- to not even being able to halve it. That one-point swing was also the difference in the U.S. team's 15.5-14.5 win. “I was pretty sure what the line was and I made a good stroke,” Lahiri said. “But I think I did what I've done all week: misread putts.” You can watch the final putts from Kirk and Lahiri below.